These insects can cause tremendous wood damage. 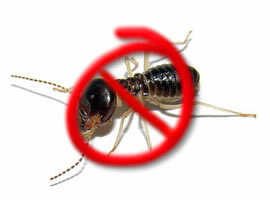 Lumber used in residential structures is susceptible to termites. Subterranean termites live in colonies found in the soil. Termites require moisture, favorable temperatures and a wood supply to exist. When wood is not readily available, termites will construct shelter tubes leading from the soil to the wood. These tubes serve as highways back to the colony. They cannot live in sunlight. Termites usually east inside wood following the grain. Termite-damaged wood contains galleries, which are chamber like voids in the wood. Our termite inspectors probe wood areas to detect termite damage, check wood that is in direct contact with the soil, and look for shelter tubes. When active termites are found a pest control applicator will apply a chemical barrier around the house where termites are detected. Termites cannot pass through these barriers and survive. The termites in the residential structure will return to the soil and die. Those on the other side of the barrier cannot reach the house. Carpenter ants make large, intricate galleries in wood for the purpose of nesting in it. Carpenter ants, unlike termites, do not eat wood. Initial evidence of infestation is often a small pile of sawdust that has sifted down from the gallery entrances. Carpenter ants often nest in hollow spaces such as walls, hollow doors and ceilings between multilevel dwellings. Other common infested locations include porch pillars, sills, joists, studs and interior casings. Ants enter and exit through cracks around framing and vents. Carpenter ants prefer moist wood to chew and excavate. Carpenter bees are large bees capable of causing extensive damage to a wood structure. Carpenter bees are similar to bumble bees in size, but have a shiny, fat abdomen. They have quick abrupt flying habits. Carpenter bees do not eat wood. They dig channels in the wood to provide living quarters during winter. Carpenter bees attack all wood, but they prefer softwoods that offer the least resistance to digging. There are many different kinds of wood destroying beetles, but probably the most common and most destructive is the Powder Post Beetle. The adults mate, and the female lays eggs in cracks and crevices on the wood. Shortly, the larvae hatch out and burrow into the wood, feeding on it as they tunnel through. When finished growing the larvae tunnel close to the surface and pupate. When the adult hatches out, they chew to the surface, mate, and the cycle repeats itself. Powder Post beetles are second only to termites in destruction of wood and wood products. They can actually be built right into a structure by using infected wood during construction and are sometimes brought into structures with firewood. We are happy to answer any questions you may have. Schedule your termite inspection today! For an immediate quote call us at 888-558-1574.